I took a groovy vintage light fixture and magazine rack into a neighborhood shop, and received $60 for my efforts. This is a big deal, as I normally slog through the work of photographing, describing and then waiting on buyers in order to sell my thrifted items. However, learning that I can simply bring a new category of stuff into a nearby store for immediate compensation is a game changer. I already do this for certain categories such as Thule and Yakima bike rack component pieces, (Thank you, ReRack store!) but this is a better, stronger, faster method for my reselling side gig. I also sold a pair of Furby slippers in less than 24 hours from bought to sold. Cha-ching! I cooked up a huge pot of turkey noodle soup using the leftover Thanksgiving carcass and various tidbits from the fridge. I’ll likely throw the majority into the freezer for when the words “leftover turkey” are no longer an expletive. I returned a library book that was only one day late, I arranged not one, but two (!!) Goodwill thrifting play dates, I picked up a few miscellaneous items for resale, (gotta replenish the merchandise!) my husband added 2% milk into a container of whipping cream for use as coffee creamer and I walked into Trader Joes and bought nothing more than the bananas, plain yogurt and lunch meat from my list. A Herculean effort during Candy Cane Joe-Joe season. I guess I should give everyone fair warning to not cross me from here on out, as I now have unlimited access to intimidating legal letters of complaint. This is going to be fun. 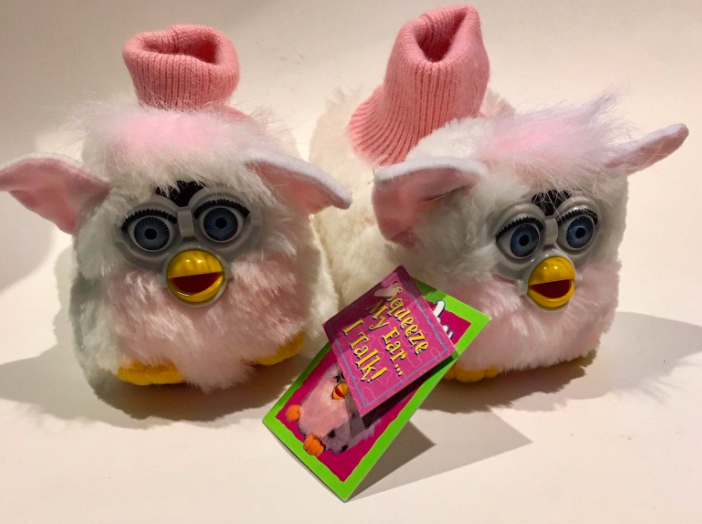 LOVE the Furby slippers, definitely one-of-a-kind. Have started a 5FF list but only have 2 items after posting 21 frugalities a few days ago. I don’t do well at consistent listing. Leftover turkey as a pejorative term! Took the Kia to my free weight loss class instead of the van for better gas mileage. Stashed the cookies grandma and grandpa left in the freezer. Have a party on Saturday and am supposed to bring a dessert. Bought a gift for my husband’s cousin, also our kids godmother from a small shop, they gave me a deal, and I got to support a friend. Opened up the house today (southern California) to let the germs out. Kids are down for the count with Hand, foot, and mouth disease. Having my first consultation with the surgeon I am switching to. Bariatric surgery for $0, thank you railroad benefits. Ugh, we have Impetigo here. We are going through bandaids like mad. I have to keep the spots covered or the scratching spreads them to other areas…so frustrating. Good luck with your new doctor. Oh, I’m sorry! We haven’t had that one before. Good luck! 1) I made sure a neighbor with a brain problem got medical care by driving her and prompting her to give additional important info relevant to her symptoms. Cost only a little time and gas and having remembered previous conversations. 2) Stopped at a grocery store that occasionally has good stuff in a markdown basket. I didn’t have high hopes, but it was LOADED with produce! I got 15 bell peppers, 4 avocados, a jalapeno, 2 pears, ~3 pounds apples, ~3 pounds tomatoes, and ~ 3 pounds grapefruit for $8! They were past their prime but quite usable and I’m making good progress on using them and processing for freezing. 3) Son requested the first couple books in a series he decided he was interested in and I had hubby pick them up from the library while he was out on errands. In 2 days, he’s most of the way through the first and wants me to get #3 and 4 while I’m out tomorrow! 4) Made neighbor a homemade heating pad– soft fabric sleeve filled with rice, sew or knot shut, microwave one minute. 5) Still driving the same reliable 16 year old car, didn’t buy a gold-plated sports car. 2. Husband needed an ugly sweater for a party. I dug out a hideous sweater my beloved grandmother made me about 20 years ago (she died soon after so I could not stand to throw it away and have moved it to three different houses) and he wore that. We are exactly the same weight and height, so sharing clothes is not unknown in our house. Bonus: he won the ugliest sweater prize of a $25 gift certificate to KFC. Thanks, Grandma. 3. Every year a close friend asks me to make perogies for her birthday. It is a pain so I only do it once and year and make enough for us, too. For my birthday, she always gives us a HUGE pan of delicious homemade lasagna that serves us for about four meals. This type of food exchange costs us no money, since we spend about the same amount on ingredients and get about the same number of meals out of each other’s cooking. We have been doing this for about a decade now and we love it because it means we will both be very happy with the gift received. 4. Years ago, when we lived in a village of about 600 people and all entertainments were homemade—no pool, no theater, no bowling, nothing but what we could come up with. Husband and I learned to like puzzles and though we now live in a bigger city we keep one going on a table and finish it in fits and starts. The local library just started a free puzzle exchange, so no more money will be spent on puzzles! For our first one we found a nice Christmas themed one. 5. I am done with my Christmas gifts. Except for my husband and sister, most of them will be baskets of various items I grew and canned this summer, such as jams, apple butter, pancake syrup, and sweet relish, surrounding loaves of challah or chocolate babkas I will make in December. Drinkers will also get a bottle of cranberry liqueur. You’re number 5. I wish I was in your family! I love the idea of doing a food exchange especially for two. Most of my go-to recipes feed at least 6. I cooked large quantities for years when I had 3 children at home. It would be wonderful to cook once and have two completely different meals. Oh my, the sweater story is priceless, lol! Can you share your chocolate babka recipe? Pierogies — YUM! That’s a great food share you have going. My next door neighbor showed me how to make Pierogies a few years ago. It was easy but a lot of work so I never made them again. This year she just gifted me a fresh bag full and I ate them immediately. They are so good. I love the Christmas baskets you are putting together. They will probably be everyone’s favorite present! Love doing baskets. My family has learned if you want more you must return the jar and the basket. I use peach baskets from the farmers market with a simple bow. People put their requests in early. Some of the most requested is Thai sweet chili sauce, eel sauce, pickle relish made with a bread and butter recipe. For Easter everyone wants watermelon rind pickles. I also include things like homemade cleaners and homemade laundry detergent. I want to be remembers just like my grandmother is. I found a very cute set of queen sized cotton percale sheets at the bins. For dinner, I made chili with the rest of the turkey and the family didn’t even complain! 1. When I was told the road was closed and I could stay at a hotel I opted for another night in my tent. I was only 15km away from my final destination but it was getting dark, the alternative route added another 10k, the road conditions weren’t that good plus there were loads of trucks. Nothing I fancy doing in the dark. 2. Getting to the climbing hostel a few days before my friends do. Staying in the dorm until they get here as having my own room is not that important to me. During the day I am outside and now I am sitting in the common area anyway. Extra-bonus: I am actually the only one staying in the dorm so I could choose my bed. It’s in the corner, half underneath a staircase. Feels so cozy! 3. Opted for going to the market with the hostel owners (and everyone else staying here) so got a free ride, local breakfast and some snacks to take climbing with me and kumquats! 4. When I arrived at the hostel I went pear picking with the owner and another guests. We had a lot of fun and the owner actually went back to get climbing gear as we couldn’t reach some of the pears even so we had a long stick with a picking basket. So a lot of free fun and free food. 5. Didn’t buy a dress in Lijiang, the last city I’ve been in, even though I really really felt like it. Couldn’t find anything I liked as it’s actually not the right season anymore. Refrained from buying souvenirs apart from some postcards. When I sent them off, the people working at the post office had to make two calls to find out how much I had to pay and how to deal with them. Seemed to be a curiosity that some foreigner walked in to send of postcards. It’s my fourth batch I sent off and actually only the first one ever arrived… Fingers crossed for these ones! Oh and as a bonus: no black Friday or single day sales j(that is the 11.11. Here in China where you can buy with huge discounts) as I was cycling and not interested in buying anything or subscribing to any service. Even though some to learn Chinese were tempting but it’s only our if I ist it and I’m not sure about that atm. There will be other sales. 1. So far this week, I’ve barely gone anywhere. Feeling sick and in too much pain to do anything, so at least we’re not spending money on things we don’t need to. 2. I knit my daughter a bunch of stuff from yarn that was just sitting around in my stash. She’ll love it all. 4. I made homemade Febreeze! Definitely helps with the stinky teenager room. 5. I bought a giant bag of carrots from Costco. GIANT. Last night, ten of them went into a batch of carrot-ginger-sweet potato soup. Seriously good and I’ll definitely make it again…because we have a LOT of carrots. Would you be willing to share the recipe for the carrot-ginger-sweet potato soup? It sounds delicious, and I happen to have all those ingredients on hand right now. 1. I walked to the store and received 10 plus pounds of apples free for buying a gift card we will use. It was a save $10 on groceries when you buy a $50+ gift card (you can be sure that I only bought one $50 gift card) offer. 2. I have been working through my stock-piled legumes. I just finished a pot of white bean stew and will make a lentils and vegetable soup for dinner. 3. I made a spreadsheet for holiday gift giving. Why did I use a paper list other years??? 4. I picked up boxes of chocolates at a local shop. They accidentally gave me one more box than what I asked/paid for. While I would have enjoyed having some chocolate for myself I couldn’t keep the box. They thanked me for being honest. 5. Someone on Nextdoor was looking for puzzles. We had some that we hadn’t passed along yet. I put them out for porch pick-up and received a nice thank you card. I love promoting the re-homing of items that we don’t need. 1. Made a BIG pot of taco soup yesterday using dried black beans and 2 lbs. of ground beef bought on sale for $1/lb. Should feed us for days and I will freeze some too. Our local MLS team is in playoffs this eve so we will watch the game and eat taco soup. Free entertainment and GO TIMBERS! 2. Had a lovely visit with a friend yesterday who came by for a cup of tea and a walk. Served banana bread made with all my leftover bananas (which I chuck in freezer when they get overripe). Also made two loaves for freezer which will come in handy over holidays. 3. Took my car in to Les Schwab (a local tire company) to have the tires rotated. They are known for their excellent customer service and provide this service for free. 4. Making a grocery list today — will do a mini grocery shop tomorrow to buy just loss leaders that we will use. This will include some items for the gift basket my kids always give their step-grandparents for Christmas. Once the season starts I buy 1-2 items for the basket every time I shop and by Christmas I have quite the haul. My in-laws are incredibly generous to us and to my four twenty somethings so this is a gesture to let them know it is appreciated. 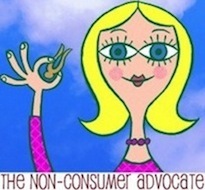 And almost everything in the basket is consumable so no consumer waste. I still need to find this year’s actual basket — at Goodwill, natch. 5. My oldest friend has been out of town since my surgery but is back now so she announced that today she is picking me up to take me for pedicures and lunch. Incredibly generous of her and a treat for me — I could really use a pedicure and doing it myself would be hard with a still-sore tummy but was hesitating to spend the money so very serendipitous that this is what she decided to do! I am blessed with all the caring and support my friends and family have shown and am so happy to be on the mend. Back to work Monday. It was great — we had a lovely visit and I have bright “Christmas red” toes! Thank you Bee. I love the Furby slippers! Your fourth frugal thing made me laugh. I am also trying to use some additional services that are provided by my husband’s employer. It is ridiculously confusing especially since they are technically his benefits. I have to have him translate. 1) Much of my frugal activity involved food. Although I did not cook a turkey, I bought one. It was too inexpensive too pass up. It is in the freezer to be cooked at a later date. I took all the chicken carcasses out of the freezer and made 3 batches of stock. I make gumbo on New Year’s Eve and need the equivalent of 16 cups of stock. I am now prepared. I also made beef stock from bones that I purchased. My pup then was given the marrow from the bones as a special treat. Today, I plan on processing all the pumpkin and various squash that I have. 2) I purchased a $50 gas card for $40 as part of a grocery store promotion. 3) I made another trip to the Goodwill Outlet. I got the most amazing things on this trip. I spent a whopping $19 which is not that easy to do. Although most items were for resale, two stood out. I purchased a box of vintage, highly decorated bohemian glass ($1.50) and a 1965 leather bound, slipped case collector’s edition of Lord of the Rings ($0.20).I made myself leave, but I didn’t want to — FOMO. 4) I am picking up some packing materials from a dear friend who buys everything on Amazon and other online sources. She is kind enough to save the boxes and air cushions for my eBay sales. I have tried to convert her to a less consumerist life style, but to no avail! I must love her just the way she is. 5) I continue to do all the usual things – drinking primarily water, brewing my coffee at home, wearing thrifted clothing, batching errands, and reading library books. Since the oppressive Florida heat is now gone, I also find myself outside with greater frequency – not using the heat or air conditioning. Love that! 4.4. My husband is like your friend and gets Amazon boxes alot-insert eye roll here. I tell all my friends that I have a stash so when they need boxes for moving, storage, etc. , they know where to come. I also use boxes for things that lots of people buy those plastic storage containers for such as packing up summer clothes, storing firewood, toy storage, etc. My kids have cardboard boxes sitting on the shelves in their closets that we painted fun designs on to store their socks/gloves/hats in instead of using a drawer. I painted my grandson some primary color, various sized, taped shut boxes to use for stacking. Just thought I would mention in case others have alot like us. We are now vegans–never thought I would say those words. Going vegan during the holidays in the South is pretty extreme. My husband has numerous health issues and the medicines aren’t working anymore so we are making some drastic changes. I am learning as I go and it has cost more, but I am getting in a groove so we will call this FFT- New Vegan Edition. 1. I found a lovely thing called canned green jackfruit about 3 days in, it was a game changer. It very closely resembles pulled pork, is $3.59 for a can, and is quick to prepare. Served with BBQ sauce alongside slaw and baked beans makes a perfectly rounded meal with Southern feel. Considering the cost of real meat, this is a frugal meal. 2. I have been experimenting with making a substitutes for ground beef with a mixture of black beans, super dry cornbread, and some herbs and spices. So far, we have had spaghetti and burgers with it and it’s pretty good. My kids haven’t even noticed the change. 3. I made some alfredo sauce from a recipe using walnuts online that was delicious. I think I am developing a bit of a nut allergy so I will have to experiment more with that. Bags of walnuts were on sale at Kroger for $3.99. Since nuts are pricy, I am going to continue to follow the sales and experiment with whatever nuts are on sale. 4. We are jumping on board with Katy’s Buddha bowls for quick yet cheap lunches. 5. I guess the best frugal thing is since is difficult to eat out, we are saving money by eating at home. Also, I do seem to have a bit more energy. I forgot to mention that I made a meat substitute called seitan but since I just made it yesterday I’m not sure how it will work out. Any thoughts on any of this is much appreciated, TIA. My favorite vegan resource (and limited diet resource) is the Oh She Glows website and cookbooks. Or thestonesoup.com . Both give options for substitutions, and the food is really good and not too complicated. Good luck to you and your husband. This is a difficult time of year to switch, but it will be worth it for good health! I am keeping all your suggestions to look at when I have a chance. So far I’m pretty proud of how well we have done. Sometimes we accidently consume things I thought were ok and I am still getting used to having to pre-prepare so many things. Since we work a lot it, preparation is key. Thank you ! Hi! Vegweb.com is a great resource as is the blog/newsletter from vegetarian times. also, clean living magazine has a blog and newsletter. some of their recipes are vegan. check out the vegan banana bread on vegweb. OMG so good! i can’t make a regular banana bread anymore. Oh, thanks for the banana bread recipe suggestion. I have several that are going bad right now. I copied and pasted these suggestions , thanks so much! I’m not vegan but my friends who are like Vegan with a vengeance, Veginomicon, Thug kitchen. The last one in particular is about vegan on a budget. Of course, I need that vegan on a budget one for sure! Thanks so much I will be browsing all of these suggestions. I was vegan back in the ’90s for a couple of years. I’m vegetarian now. There are so many more choices now for both vegans and vegetarians. Your ground beef substitute sounds tasty! Did you feel better when you made the change for those two years? I’m hoping for less arthritic pain and more energy for myself. The “faux” ground beef I have found to be so much about the color/texture. Experimenting is kinda fun when I don’t have to hurry. I want to be able to have large batches of meat substitutes similar to when we had meat for quick meals….and/or…get adjusted to eating a lot more high protein beans, veggies, etc. We’ve been vegan for about four years–I have less joint pain, fewer headaches, and no diarrhea. My favorite cookbook is Robin Robertson’s 100 Vegan REcipes. Jennifer, you might want to look into a macrobiotic diet also. It can be modified to be vegetarian or vegan. It is believed to beneficial to those with cancer and chronic illness, but it can be restrictive. Can I ask why the alfredo recipe calls for nuts? I have to accommodate multiple food allergies, and I always make alfredo using gluten-free flour to thicken it, and rice milk + a variety of herbs and spices. I’m trying to figure out how nuts would figure into it. I have several recipes that use cashew cream (a fancy name for cashews, soaked and blended) as a replacement for milk products. I’m guessing that’s it. Late to the party — wishing you all the best! Another great source of veggie/vegan recipes is The Minimalist Baker blog — seriously delicious and adaptable recipes. Red lentil coconut curry and Red lentil veggie chili were outstanding and could be made from the stuff I had on hand, pretty much. And it’s not a dessert or baking blog — lots of savory goodness that defied even my lame assaults on substitutions. Everything tasted WONDERFUL and was frugal to boot. Good luck — hope your husband is feeling better soon! 2. Son has found a ride home from college for xmas break, sparing me the 11 hour round trip + gas + food. He’ll buy his driver gas and a meal, but I will still come out ahead as there is another passenger to split the gas with. 3. Working hard with 2nd child on college scholarship essays. Praying they get us somewhere as we don’t qualify for normal financial aid. 4. Used snowblower gifted to us by neighbor who moved to Florida last summer to clear the Chicago blizzard snow from the driveway. 5. Made my own latte at home this morning despite my thoughts of heading to Starbucks. 1. Preprepped dinner for last night, since I knew I had a substitute teaching job that day. Dinner went easily into the oven, and I have leftover vegetarian shephards pie for lunch today (in the rain!). Used up the last of the veggie broth I made a week ago, so no waste and yummy food. 2. Went to Target Tuesday, and only bought one thing (well, one and a gift): Pyrex storage bowl with hedgehogs on the outside for $6.50. The second bowl will be filled with goodies and taken to a gift exchange. I can’t remember the last time I bought something new, and I’m feeling good about the price on this, especially since it’s made in USA. 3. Stopped by Costco and waited in the line for gas. Saved 80 cents over a gas station I saw later that day! 4. Took my son to the free grief therapy offered through my husband’s employer. We didn’t know about it until really recently, and I’m loving the results! He’s so much happier and more…relaxed. 5. Soaking black beans for dinner tonight. We have rain for the first time in a long time, and I’m making the most of it! 6. I remember what I wanted to post earlier: we finally tried banana as a substitute for eggs, and it worked beautifully. We have over 60 pounds of bananas in the freezer right now, and I have to buy eggs since the chickens stopped laying, so this is a really good substitution for us! How do you use the bananas instead of eggs? Do you know if there is anything else that can be used in place of eggs? I hate our egg prices. Cindy, I have found that many recipes that call for eggs can be made by just leaving them out. You can add a spoon of mayo instead or some applesauce. Also, if I make a store bought cake mix, a can of packed pumpkin or a can of soda can be added. I don’t put an egg in my cornbread anymore either. Just make the mix a little less liquid and it holds together just fine. I have made banana bread and sweet potato bread and just left out the eggs and it was perfect. I use one banana for two eggs. Amy Dacyczyn recommended 1 tsp ground flax seed and 3 tsp water for one egg — I’ve found that also works well in savory items (or things I plan to eat, because I hate banana, but the family doesn’t). I look forward to when the chickens start laying again, because I miss scrambled eggs for breakfast! Holidays are always expensive, but we made the most of it! 1. Hosted thanksgiving at our house for the first time. While a budget of $150 is hardly frugal, we managed to stay under it by asking other people to bring some sides and still got to cook everything I wanted to. Staying under budget, whatever it is, still feels frugal. 2. Made a fantastic turkey chili out of all leftovers! Unfortunately, it seems I still hate dark meat even covered in chili, so the BF will be enjoying it for a few more lunches than originally planned. 3. Need to catch up with a friend and originally had dinner plans. Since the turkey chili is not my favorite, I asked to change them to lunch plans. While I don’t have lunch food with me, there are plenty of ingredients in the fridge waiting to become dinner! 4. Only went over my Christmas spending budget by $30. For a serial over-gifter, this is huge news. 5. Found out I had the weekend off from work, so we are heading up to Lake Placid for some free skiing at Whiteface (free tix from a ski expo this fall-about $150 value) and to see my nephew in the Nutcracker for $10. Even got a great deal on a hotel I enjoy so I’m looking forward to this little getaway before the parties really ramp up! Getting wills done for free is a huge benefit! We had to redo ours as we moved to a different state and it was pricey. If you can get durable powers of attorney, health care powers of attorney and advance health care directives done for free too you will have everything you need unless you want to set up a revocable living trust. 1. Just got home from CVS and only bought the 2 items on my list. Coupon applied to one not on sale. $5 extrabucks printed out. If nothing comes up as a need I always use them to get kleenex LOL. 2. Thank you DIL for wanting gift cards for your birthday. No shipping cost. 3. Mailed a single tree ornament to our 2 year old granddaughter for her first tree. Reused packing materials. 4. Wearing thrifted top, cardigan and necklace plus old jeans. 5. Took idea from neighbor and left our quite dirty car out to get rained on (not frequent her in S. Cal!). Dried off the windows, etc. once rain stopped for a free car wash.
1. Went to the consignment store and dropped off a box. We also bought work boots, boy athletic pants, spiderman jenga, and a popsicle tray. The total was $32, but we had $17.40 on our account from sales, so I used that towards it. 2. Got 35 more cents on Ibotta. Been earning a few swagbucks which I cashed in for $5 Amazon and I have enough for another $5. 3.I did a craft with my kids and nephews using things I already had, q-tip snow flakes. 4. Drove cautiously today to save on gas, then filled up at WalMart for $1.94. 5. Traveling to another city to babysit my nephews while their mom has surgery. We are all getting an AirBNB instead of a hotel. This will be our first time using AirBNB. 5. I recently had my first airbnb experience and it was a great one. I did realize that I would be giving a review of my host but I did not realize she would review me, also. I wasn’t worried, as we are respectful of others property and things associated with that, but it’s something to know. Also re #5 — I am a big fan of vacation rentals over hotels, used VRBO for years before Airbnb came along, now tend to use them. I also know people who have had some bad experiences (late cancellations, dirty places) and so I am very careful to only rent places with many positive reviews, which I read carefully. Doing this I have not had a bad experience in probably 25 years of using vacation rentals. I am aware of the problems Airbnb is creating in siphoning what would otherwise be housing stock off into the vacation rental market. I am careful to check out the legal regulations where I rent and to comply with them (for example, most Airbnbs are illegal in NYC but it is legal to rent a unit in a two unit building if the owner lives in the other unit, so when we wanted to stay in NYC we rented the legal basement apartment of a lovely brownstone in Brooklyn). My hope is that more cities will regulate Airbnb to meet the needs of their locale and that by complying with those regulations Airbnb can coexist with and not cannibalize rental housing. 1) Went to pick up prescriptions from the grocery store and used the discount card option. Running it through our insurance costs more, grrr. 2) While there used some coupons to pick up a gallon of milk, a pound of lean beef, a small veggie tray, and two smoothies for $2.68 out of pocket. 3) Making my coffee at home and work. 4) husband called about a bill. $1700 for blood work at his PCP. And it was just routine stuff, BMP, thyroid and such. They ran it under the wrong code. 5) Went to pick up another rx and they said it would be $750. I am disgusted and appalled with our healthcare system. We have excellent insurance and few health issues and the OOP costs are so outrageous. Sorry for the rant! I declined the RX and asked the pharmacist to call our PCP for a cheaper, covered option. Re your #2 — wow! Trying to seriously avoid double, triple, quadruple 5FFs, so working on keeping an ongoing current list. 1. Realized I have a re-useable small rectangular container perfect for transporting & storing sandwiches for work lunches. It came from a rare purchase of sliced deli meat during a visit to family. It is a small step but an attempt to reduce unnecessary consumption (sandwich bags). 3. Two free lunches this week during long 8.5 hour work days (this is my for-profit job’s slow season). Cut gifted sticky rice roll with pork from client into 2 halves. Using extra frozen apricot sauce packets to add seasoning which are left over from DD’s love affair with vegie egg rolls. To up the protein, divided left-over steak & fish from free retirement dinner to use on the sticky rice. 4. DH won lovely Scottish shortbread gift assortment in raffle at work. We will enjoy using it during the holiday season. 5. Gifted a butternut squash by neighbor, so will make an attempt at squash soup this upcoming snowy weekend. Maybe a Panera Bread recipe knock off. Last year at Christmas we drove from Phoenix to Indianapolis non-stop to visit family. We took turns driving and napping. We felt downright sick when we got there. OMG, Furby slippers. So random and weird, yet someone else is thrilled to have them! 4. Getting my garden watered for FREE with the recent rainfall. This is huge, as I live in Northern CA. We are dry, dry, dry. Add that to the recent wildfires + hazardous air quality, and it was downright miserable here. Rain is making me happy! 1-	Hulu ran a Black Friday/Cyber Monday promotion offering a 99¢/month rate (locked in for 1 year) for new subscribers. I had been considering dropping Hulu since it’s the TV service we use least (we cut the cord years ago and went the Amazon/Netflix/Hulu route), but at $12 for a year it’s a keeper. The benefit to the new account/new profiles is that we discovered content that we didn’t know had been added. 2-	Last year’s promotional rate for my NY Times digital subscription had expired, and I contacted customer service to cancel. To persuade me to keep the subscription, they offered a $1/week rate for a year, which I accepted. I could get access via my local library, but it’s limited. Being frugal elsewhere means that I can pay for a couple of subscriptions that are of value to me (but I’m not going to over-pay!). 3-	I saw a notice that there was a recall on some Therma-Care patches. I knew I had one box of them, and when I checked the lot number/expiration date saw that they were included in the recall. Instead of just discarding them, I spent 10 minutes on the phone with Pfizer to have a replacement box sent. 4-	Didn’t host Thanksgiving this year, but still took advantage of grocery sales to pick up 10 lbs. of 39¢/lb acorn and butternut squash. They’ll hold in the pantry for a while, and will end up in quite a few pots of soup this winter. 5-	Keeping an eye out for bonus/discount gift card offers. Christmas gifts for the adults in our extended family are baskets of homemade goodies, but we do buy some items (including gift cards) for our nieces and nephews. We sometimes use credit card reward points to “buy” them, but will also take advantage of the special offers that our local supermarket and drugstore often run at this time of year. I just saw a Facebook ad saying that if you bought a gift card online from Taco Bell for $10 you get another $5 one free. 2. Wore a hand me down blazer for work meetings today and a shirt that I’ve had for ages. 3. Refrained from buying a present for someone who I already have a gift for. 1) Made dinner from scratch using elk meat that my dad sent me (he hunts), homemade foccacia bread recipe and leftover BBQ sauce hanging out in the fridge. 2) Trash picked 2 bales of straw from the neighbors that had used it for Halloween decorations. I am planning on spreading it in the garden. 3) Opted not to buy my youngest’s gymnastics pictures as I had just purchased school pictures. 4) While dinner was cooking in the oven I made up a breakfast quick bread from scratch to bake at the same time. 5) A coworker is always offering to get us something from the bagel place that she stops at in the mornings each week. I finally said yes to a bagel toasted with butter and it will be my lunch tomorrow. Not the healthiest, but it will be tasty. And I have been struggling in the decent lunch department and scrounging for weird combinations. This will be a nice change and not cost me anything. 6) I have met my Swagbucks goal every day this month in an effort to earn more giftcards to give as Christmas gifts. 1. Used my employee discount for dry cleaning my sister’s dress I borrowed for a black tie event. 2. Free BBQ lunch at work today. 3. Free coffee with a colleague today. Needed a debrief and he paid. 4. Working many hours, not much time to spend money. 5. Almost to the end of the year and I have kept to my clothes shopping ban pretty well. I just wanted to take a minute to tell you how much I look forward to reading these. I appreciate that you take time out of your days to write these up and post them. I gather encouragement, ideas and just plain joy out of reading them. Thank you! Couldn’t agree more. This is my first stop anytime I log on to my laptop! Yep….and thanks to all that take a moment to comment. No matter how insignificant the frugal things we do each day seem, someone may learn something new or at least get some motivation. I too really value this community. The ideas and thoughts are always helpful if only just a reminder of how the little things add up. The community is also lovely. I recognize so many names and love hearing on going stories of lives whether kids, health issues, financial struggles, or wonderful “wins”. Thanks to all who post and make this such a great community! 1. DH. had a long chat with the vet regarding the cat’s blood test results. DH suggested we adjust the amount of insulin he gets to see if he improves, rather than pay for another expensive test. The vet agreed this was a good option. 2. My DD is furnishing her first apartment as frugally as possible, and scored a free leather loveseat from a neighbour, who is renovating and just needs to get rid of stuff. Also got a coffee table and end table. 3. DD has hardwood floors and needs rugs, I got a lovely one at a thrift store for $30. 4. I paid for $600 in grocery store gift cards to receive 600 air miles. This works out to approximately $60 in free groceries. Food is so expensive here, we need all the help we can get, and I would have spend $600 in groceries anyway. 5. DH is trying his hand at woodworking and making DD a stereo stand. While this is not at all frugal (he is buying tools, etc, and having to buy more material when he makes an error, etc) it has been good for him, keeping him busy, etc. He did need to buy an iron for applying the wood tape, and bought one at a thrift store for $8. 1. I picked up some Wave Clips and decided to fix my own hair for the Gala tonight. My friend and hairdresser’s husband is in the hospital. Prayers going up for him, he has some serious health issues and she’s dealing with a lot. 2. Sticking with PB on a caramel rice cake for breakfast and eating less carbs and late meals has brought my cholesterol down over 30 points. Hopefully it will bring my weight down as well. 3. Our Team is doing a potluck before Winter Break, so I decided to use up the dip mixes I have at home and bring those with raw veggies and chips for the potluck. 4. I plan on taking off the entire 2 weeks of Campus Winter Break. That should help me get more things done at home and less travel, so I’ll save gas. Although, fuel has gone down to $2.19 per gallon in my area. Yay!! 5. No purchases of Lear jets, yachts or gold covered anything. 1. DH and I took a walk through the woods today. Afterwards, we sat in the car parked next to a horse corral and drank hot chocolate brought from home in a thermos. Nice date. 2. I am in the process of selling a toy organizer my grandkids outgrew on Facebook Marketplace. 3. I received the nicest compliment from a man the other day. As I was pulling into my driveway, the oil delivery guy was just finishing up. He came over to my car window and said, “You did really good this time. Your tank only took 52 gallons.” He really knows how to flatter a frugal girl! 4. #3 made possible by thermal underwear, sweatshirts and cozy blankets. Our thermostat is usually kept at 60 degrees with the occasional push up after nightfall. 5. I don’t anticipate buying any new holiday decorations this year with the possible exception of tree lights. I’m going to look for the old fashioned kind with the screw in bulbs. I’m tired of throwing away dead or half dead strings of lights only to have them end up in a landfill or incinerator to be spewed out into the atmosphere. Sad face with wrinkled nose here. I LOVED your number 3, about the oil delivery guy! We have had the same guy for a few years and he always brings our giant hounds dog biscuits. As soon as they hear his truck pull up, they start whining to be let out for their treat. We are so lucky that our postman, our newspaper woman and our oil guy have all stayed in their jobs for years. Are you in Alaska? I thought I remembered that. If so, were you affected by the earthquake? We were woken up by the rocking and rolling up here in Fairbanks, but no damage. Anchorage, the center of the earthquake, is 260 miles to the south of us. There is one highway between here and there, but the roads that lead into Anchorage are wrecked and the railroad can’t run right now either because of the ground along parts of the track opening up. Fairbanks is in the northern part of Alaska, Anchorage is in what is called Southcentral Alaska. Our state capital of Juneau is 661 miles from us, although you cannot drive there, only fly or take a ferry. I’m glad you’re 0kay. I always like to read your posts especially about your dogs. A girl in my bariatric closed group on facebook said it happened 2 min before she was going to be rolled into surgery. Can you imagine being under the knife in that kind of situation? I’m really glad to hear you and your family are all fine in the wake of the devastating earthquake. You take care. 1. Gas is $1.94. I love it! 2. I went to the Salvation Army and did not buy a thing, as they did not have anything I needed. 3. I bought 16 lbs of potatoes for $5, which is a good price for potatoes here, 50 cent a lb of chicken thighs and legs (I do not understand why chicken is so cheap here, and eggs are so expensive at $1.50 a dozen), $3 for a HUGE bunch of turnip greens and the turnip is included (sometimes down here the turnip is cut off because folks do not like the turnip as well as the greens in this part of the country), and something else but I cannot remember….sigh. 4. I will be using the $5 off $25 at Dollar General today to buy canned vegetables at 50 cents a can (pre-coupon) and cat food, etc. 5. I made a stir fry with turnips, carrots, rice, and the greens yesterday, and it was delicious. I have decided to quit whining about always having to cook at home (I live in the boonies, and there are virtually no restaurants where I work) and just enjoy the savings. Wow, the cheapest eggs here are $3 a dozen! $1.98 dozen in Portland Or but the best price I ever see on chicken is .79/lb. for whole chickens on sale. #1 – gas here has dropped to $2.09 for regular unleaded. My jaw dropped when I saw that. I need to fill-up before the storm hits on Friday. I’m loving all the vegan website suggestions. Thanks. 1. I’m working every day on my Swagbucks and Erewards and I just purchased another Christmas gift card @ 12% off. You are allowed one discounted card each month. I plan to take advantage of that next year and buy all gift cards @ a discount so one each month. 2. I sold another item on Ebay. I also reused shipping boxes and packing material. Money in, crap out. 3. I purchased six months worth of heartworm medicine for my dog which meant I got a discount. 4. I bought stocking stuffers for son-in-law and daughters boyfriend with coupons and old gift cards so I spent only a few dollars. 5. I learned how to use the new snowthrower my husband bought last year to clear the snow out of my driveway instead of hiring it done. I had to pay to have it put on the tractor but still a savings. 1. Baked pork loin with cubed sweet potatoes and onions. Easy and good for two meals. DH loved it. 3. Taking items I already own but no longer use to a white elephant game at a Christmas party. Taking a dip that I have already made but froze. 4. Making lots of seasoned ground beef and turkey to freeze for future throw together dinners. 5. Going through my holiday decor to see what I can send to my daughter that would be meaningful. Frugal fail: LOTS of sales popping up on my email. Was bored and tired one day and bought some work blouses that were on clearance and 60% off of those. I’m mad at myself, as I buy most of my wardrobe at the thrift shop. MommaL I can so relate to your frugal fail! I am almost done Christmas shopping thank goodness since when I see “great deals” I get into this “2 for you 1 for me” mindset and then just feel bad afterwards because notwithstanding the great deals, supporting fast fashion does comport with my desired ethics and way to be in the world. 2. Finally become friends with my Instant pot. I made white beans and they are fantastic. Now made turkey stock, soup and chili. All better than I expected. Got it for $40 6 months ago. I realize I got a good deal. 5. No gold plated anything! Am I the only one who finds the furby slippers terrifying?